Skiff Republic has posted yet another great interview with a man who knows his skiffs. They have posted an interview with Harry Spear, an old school guide out of Key West, Fl that has also started his own skiff building business. Want to learn more about how it all started and where skiff culture is headed? 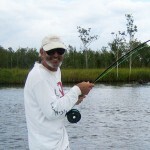 Copyright © 2012 SkinnySkiff.com - Reviews and discussions for shallow water skiffs and fly fishing the flats. All rights reserved.